The free template provided on this website is designed for use by students and their instructors to help understand the concept of converting data into clusters and then into market segments. Therefore, the maximum number of cases/responses has been capped at 100. If you are a commercial firm that requires the clustering of data, then there is a premium Excel template available for $49 (USD). It provides for up to 20 attributes, up to 10 clusters/segments, and up to 1,000 variables. The template is provided immediately (a download link for a Zip file to your email) and the purchase is via PayPal. This template is ideal for businesses that have customer database information and/or consumer marketing research results. 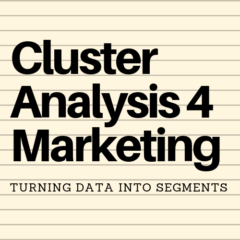 Here is the sample of marketing_cluster_analysis_for_larger_ data_sets, so you can see how it looks before you decide to purchase it. Please note: You need Excel 2010 or later to run the macros in the spreadsheet. NOTE: This template is currently unavailable (in January 2019) as it is been upgraded. Please contact me for any further details or commercial assistance with market segment development.